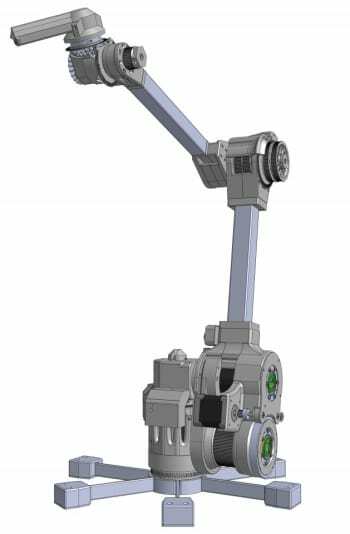 Haddington Dynamics has a very ambitious goal for their Dexter robotic arm. They want to ‘revolutionize society by making the fruits of the Robotics Revolution available to everyone.’ Kent Gilson is one of the early pioneers of FPGA circuits, and Christopher Fry prides himself on taking difficult tasks and making them simply by using artificial intelligence techniques. With their team at Haddington the pair is running a crowdfunding campaign for Dexter: the robotic arm to end scarcity. To ‘end scarcity’ the creators believe that Dexter has to be able to do additive and subtractive manufacturing, have the ability to interact with a human worker, and interact with other robots. Dexter is a 5 Axis robot with several current capabilities and a commitment to open source philosophies that the team hopes will bring on more and more functions over time. 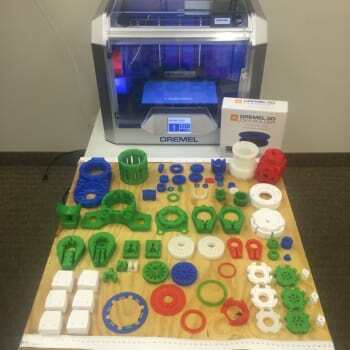 Three axes will work to do conventional 3D printing and pallet moving, while the fourth axis will let the robot do pick and place work or act as a filament extruder for the 3D printer. The fifth axis allows Dexter to draw, drill, laser cut or probe on complex shapes as the end effector can be moved anywhere to point in any direction. The full robot weights 6.5 kilograms, can be powered by only 20 Watts, has a 670 millimeter arm length and a 1 meter spherical build envelope. The stepper motor can be accurate to 5 microns with 50 micron repeatability. Movement can be up to 70 degrees per second carrying a payload of up to 1 kilogram. The Dexter Development Environment (DDE) is the main software developed by Haddington and the FPGA software is open source. Dexter is an impressive and massive in scope, and this crowdfunding effort is a small portion of the overall initiative. Gilson and Fry have been working on the project for five years already and their commitment to the open source exploration of future applications for the robot should pay off over time. The Kickstarter campaign video shown here is a little heavy handed but there are several other review and application videos on the page that show the current abilities of Dexter and discuss later possibilities. Even the Kickstarter itself is branded as more of a community building event to find users who want to help develop the first generation of robots, instead of simply looking for money. With seven days to go in the funding period around $35,000 more dollars are needed to hit the $100,000 goal. If successful first units are expected to ship in July 2017 for early birds and November 2017 for the remainder of the first run.